Wheelersburg’s Bryson Keeney (10), Xander Carmichael (32), Evan Dahm (60), and a host of Pirates swarm Jackson’s Blake McCoy as he runs with the football on Friday evening. Wheelersburg’s Justin Salyers (16) pummels a Jackson ballcarrier. JACKSON — To obtain victories on the road against state-ranked opposition, it takes a special effort in all three phases — offense, defense, and special teams. On Friday evening, the unsung heroes for the Wheelersburg Pirates’ football team — the special teams units — proved to be more than up to the challenge, especially in a key first half where two key special teams plays — a fake punt pass from Xander Carmichael to Chase Stidham for 11 yards on a fourth-and-4 on the Pirates’ second drive and a blocked kick by Stidham and Eli Ruby that was returned 30 yards for a score by Ruby — allowed Wheelersburg to obtain a 21-14 lead at the halftime break. Then, in the second half of play, the Pirates turned up the heat in all areas to wear down the Ironmen for good. Defensively, Wheelersburg held Jackson to just 64 yards of total offense on 17 plays in the second half, and added two eight-play touchdown drives, along with a 25-yard field goal by Jalen Miller, to outscore Jackson 17-0 in the second half en route to a 38-14 victory over the Ohio AP Football Poll’s No. 10-ranked unit in Division III as the Pirates — the No.-4 ranked unit in Division V — moved to 5-0 on the year. For Rob Woodward, the effort that his unit put together en route to taking home Wheelersburg’s 30th consecutive regular season win was a lot like the first 29 that occurred before that — a team effort that came about through adjustments. In the opening half of action, both teams proved to be even-keeled throughout in a great initial stanza that saw both teams come up large with huge plays time and time again. The first big play, however, was arguably the biggest of the entire game. After both teams went three-and-out on their initial series to start the affair, Trent Salyers was able to find Cole Lowery on two separate connections that allowed the Pirates to advance down to the Jackson 44 yard line. However, after forcing an incompletion on a Salyers pass that was intended for Bryson Keeney, it looked like Jackson had obtained the first big stop in the contest. Jonathan Eaton and his special teams staff, however, had other ideas. With Wheelersburg facing a 4th-and-4 from the 44, Eaton’s unit — thanks to a great sell job from Carmichael — came through as the 6-1, 230-pound standout found Stidham out in the far flat for the first down. Stidham then raced an additional seven yards to put the Pirates at the Jackson 33 on the play — a huge sequence that eventually led to an eight-yard run from Lowery, a 17-yard run from Salyers, a 12-yard pass play from Salyers to Makya Matthews after a false start penalty, and a three-yard touchdown run by Carmichael to cap off a 12-play, 68-yard drive that put ‘Burg in front, 7-0, with 5:12 to play in the opening quarter. Jackson, however, wasn’t phased. The Ironmen came right back on a 11-play drive and proceeded to drive the football right down the field as Blake McCoy and Caleb Storms each took their turns pounding their way down to the Wheelersburg 20 behind a physical and quick offensive line. However, as Jackson approached the 20, Wheelersburg bowed up. In fact, the Pirates, on a 4th-and-1 run by the Ironmen, seemingly had McCoy and Jackson on the outside looking in as a McCoy run to the left side of the field was stuffed by the physical play of Carmichael and Evan Dahm as the second quarter began, which gave the ball back to Wheelersburg at its own 20. On the opening play of the ensuing drive, however, a turnover — which, after initial discussion following the play, was ruled a fumble instead of a forward pass — gave the ball right back to Jackson. With strong field position behind a physical offensive line, Storms was able to plow his way into the end zone for the Ironmen as the 5-9, 170-pound back ran for 10 yards on a third-and-2 and followed that carry up with a two-yard touchdown run to knot the score at seven apiece with 10:25 to play in the opening half. Wheelersburg, however, came right back and answered the bell resoundingly on the following drive by using a familiar target to make their presence felt — Tanner Holden. Holden, who again starred for the Pirates with a modest, to say the least, 103 yards and a touchdown on 11 catches, used his 6-6 frame to make life a nightmare for the Jackson secondary. The junior wide receiver caught four balls for 54 yards alone on a 10-play, 80-yard drive — including a critical eight-yard catch touchdown on a third-and-goal situation from the Jackson 8 — to put Wheelersburg back in front by a 14-7 tally. On the ensuing series, Eaton’s unit emerged from the shadows once again to create a big play. After another forced three-and-out, Jackson, who had been pinned back at its own 35, lined up to punt the football away. While the ball was snapped in perfect form, a bobble by Jackson punter Michael Benson was all it took for Stidham and Eli Ruby, who were coming at full speed, to get in the way of the punt as both players converged for the block. Ruby then picked the football up at the 30 and ran the rest of the distance uncontested for the score as Wheelersburg took a 21-7 lead with 4:32 to play in the half. But less than 25 seconds after Wheelersburg scored to go up by the aforementioned 21-7 tally, Jackson brought a counterpunch to the table as McCoy, who stepped back into a well-protected pocket, fired and hit Payton Speakman perfectly in stride for a 76-yard touchdown to pull the Ironmen back within a score at 21-14 with 4:10 to play in the opening half. Despite the pressure that could come from the sudden turn of the events on the road, however, Wheelersburg remained calm, cool, and collected and maintained the seven-point advantage heading into halftime. In the locker room, that poise was evident, according to Woodward. In the second half, the Pirates showed that very gumption in controlling the line of scrimmage throughout the second half as Wheelersburg turned a close contest into a runaway. After holding Jackson to minus-4 yards on its first series en route to another three-and-out, the Pirates — despite starting from their own 29 and collecting two holding penalties that backed Wheelersburg up to a first-and-21 at one point — still managed to average nearly nine yards per play on an eight-play, 71-yard drive that ended in a 12-yard touchdown run by Salyers on a third-and-7. Then, after another three-and-out where the Pirates gave up just two yards total, Wheelersburg drove right down the field again as the Pirates went 65 yards in just six plays before tacking on a 25-yard field goal by Jalen Miller to increase the Wheelersburg lead to 31-14 by the end of the third quarter as ‘Burg — behind Salyers’ 288 total yards of offense and the Pirates’ 6.8 yard-per-carry average — continued to drive the ball down Jackson’s throat. Not to be outdone, the defense proved to be huge throughout the second half, as well. Even Jackson’s most productive drive of the second half proved to net just 33 yards on nine plays, and on that drive, Storms was stopped on a fourth-and-2 just past midfield, allowing Wheelersburg to go on an eight-play, 56-yard drive that ended in a one-yard touchdown dive from Evan Horsley that set up the final score. 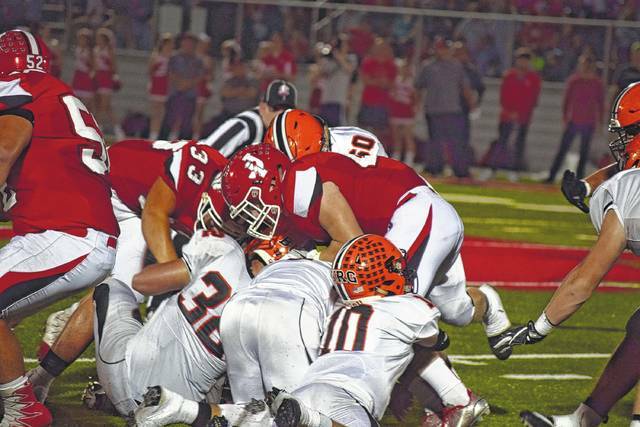 Overall, the Wheelersburg run defense proved to be outstanding once more as the Pirates gave up just 164 rushing yards on 46 attempts for a 3.6 yard-per-carry average. McCoy, who was Jackson’s leading rusher coming into the contest with 593 yards on 65 carries (9.1 yard average) collected 77 yards on 21 carries for a 3.7 yard per carry average. Storms was also held down as McCoy’s fellow rushing mate collected just 42 yards on 11 carries. With the victory, Wheelersburg, who improved to 5-0 on the year with the victory, will look to continue to build on its early season momentum when the second half of the regular season kicks off next Friday against Oak Hill at Ed Miller Stadium. In addition to defeating Jackson for the fifth time in six meetings since the two programs began meeting annually in 2012, the Pirates have defeated each of its opponents by 24 points or more so far this year. However, those kinds of stats, as Woodward and the Pirates well know, don’t come from overlooking opponents.